Many customers call upon professional housekeeping services specifically for bathroom cleaning. The bathroom of your home is one of the two most important room that should stay clean. 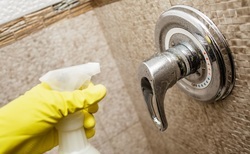 Without proper cleaning, bathrooms collect dirt, hair, grime, and mold. Our Professional Bathroom services focus on all aspects of the bathroom including: cleaning and scrubbing of the bathtub and shower, the toilet, and the sinks. We remove all mats and floor items to thoroughly clean the floors by sweeping and mopping. We make sure to clean and polish all handles and faucets as well as clean and dry all mirrors. We will even apply a mixture to prevent condensation on the mirrors. Baseboards and blinds are wiped down and cleaned well. Trash cans are emptied and floor items are cleaned. Along with these services, we can also professionally clean your shower curtains for you. As a professional cleaning service, we guarantee that your bathroom will be properly sanitized and will sparkle!